Your vineyard is speaking to you. Are you listening? Viti Analytics allows you to input, chart, and uncover the inner workings of your vineyard. Track phenological chararacteristcs, monitor disease and pest pressures, run computational transformations, and generate detailed reports. Gain insignts down to the individual vine level. Our patented technology provides a new paradigm; the practice of treating a vineyard block as a homogenous whole suffers from many shortcomings. Now is the time to bring your vineyard management strategy into the 21st century. Much of what your vineyard is trying to tell you is hidden away in things you can't see. Early stage virus expression, pest pressures, water and nutrient deficiencies. We take the guess work and luck out of the equation and translate the whispers into actionable intelligence. 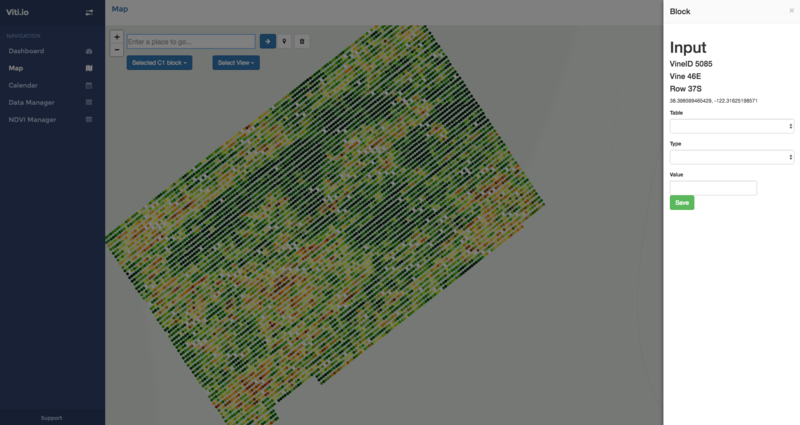 Our map view is optimized for in-situ measurements and visualizing your vineyard's data. 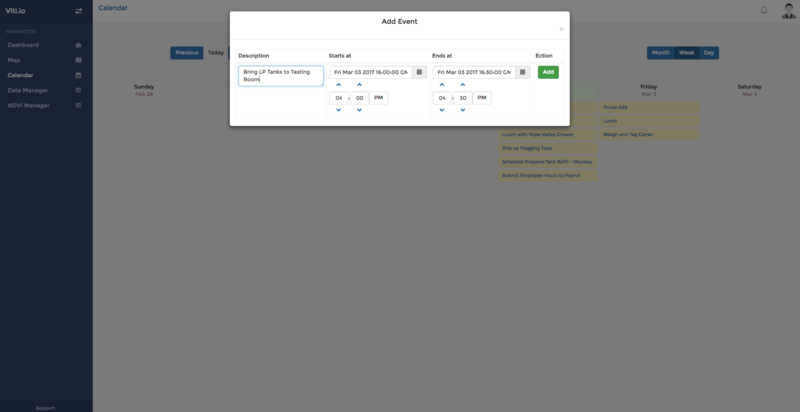 Create work orders, extrapolate data, and view results - all by just clicking on a vine. What can you do with Viti Analytics? Our map plots each and every vine in a block, where each vine acts as both an input for data collection, and an output for data visualization. Clicking on a vine yields a form for data entry, ideal for in-situ measurements when you're standing next to a vine. Upload and Register NDVI images for analysis by computer vision. Don't have your own drone? Schedule a flyover in-app from one of our FFA section 107 licensed drone operators.